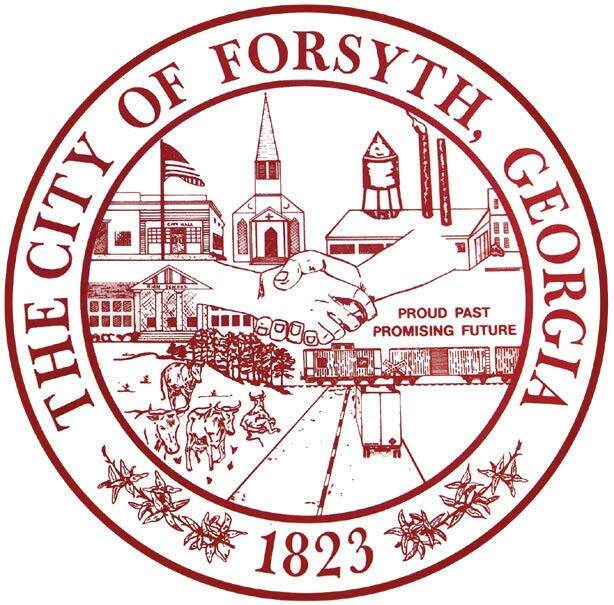 Given the variegated productivity of Forsyth, Ga., it is hardly a wonder the municipality of 3,788 has one of the busiest city seals in the nation. The seal contains a crowded collage of images, including railway cars, a church, factory, high school, city hall with an American flag, a grove of trees, several cattle lounging on a hillside and a semi truck hauling down a highway. Edging the round seal are the city’s name, its date of incorporation and two strings of forsythia flowers. Forsyth, named for eminent political leader John Forsyth, who served as a U.S. representative, senator, secretary of state, ambassador to Spain and governor of Georgia, was incorporated and made the county seat of newly formed Monroe County in 1823. The original plat consisted of 2-1/2 acre lots and was circumscribed by a circular boundary with a radius of a one-half mile from the courthouse square. By 1827, the settlement consisted of 70 houses, a few stores, an academy, a Baptist worship house, a jail and an elegant log courthouse. The Norfolk Southern railroad arrived in 1838, with Forsyth being home to the first passenger rail service in Georgia. Farming and cotton mills provided much of the economy of the day. Tift College, the second oldest female college in the world, opened it doors in 1849. Times have changed and the seal may need to be updated, according to Bo Gregory, president of the Development Authority of Monroe County. “Two key industrial partners that have moved into the city are Encore Plastics and Perdue Farms,” he said. Encore manufactures plastic products from paint roller trays to rollable trash bins. Perdue established a feed mill and hatchery in Forsyth. “We have four or five projects in the mix right now, fingers crossed,” he said of prospective new industries anchoring their businesses in Forsyth. Gregory also touted the unsung contributions of agriculture to the town and the surrounding area. He noted Monroe County has 3,800 acres for beef cattle, which bring in $3.3 million in revenue a year. Further, he said, the county, one of 159 in the state, ranks sixth in growing strawberries, ninth in peach production, 17th in harvesting catfish, 46th in dairy and 101st in timber revenue. For more information, call (478) 994-9239 or visit www.cityofforsyth.net.